We are committed to designing equipment that makes a substantial improvement in the daily tasks of aviation mechanic crews in terms of safety, efficiency, and ergonomics on the hangar deck. S.A.F.E. is well known for working closely with aircraft mechanics to design the best products that meet their unique needs, and our design team will conduct a site visit with you to measure your aircraft and design your vision on our dollar. During our initial site visit, our team of designers will speak with you about the unique needs of the maintenance crews that are working on your aircraft. We'll begin with a series of questions to help us fully understand every need you may have. Once we have enough information from you, we will create a design solution that maximizes safety, efficiency, and ergonomics for your maintenance crews. We'll then measure your aircraft to ensure that the stand/equipment we've designed will not damage the fuselage or accessory pieces that you may have added to the aircraft from the base model. When we think of customization, safety, and innovation, we picture the one-off custom products that you need to meet your specific goals. That's why our design teams work closely with you every step of the way, incorporating your ideas and feedback during the design process to ensure that the equipment you purchase from us will meet your unique needs. At S.A.F.E. Structure Designs, you will always find us standing behind those who have dedicated their lives to the protection of others. Our designs are built around one overall goal; to make sure you can take control of any situation, no matter where you may find yourself. Whether you’re performing standard maintenance on an aircraft or you’re operating heavy equipment in less that ideal situations, you’ll find that our products, services, and advanced systems technologies will help you perform your work safely, efficiently, and effectively. We have custom solutions for safe access platforms, fall protection platforms, maintenance support equipment, and much more. Feel free to contact us today to learn more about our custom design solutions and our collaborative design process. We look forward to hearing from you! 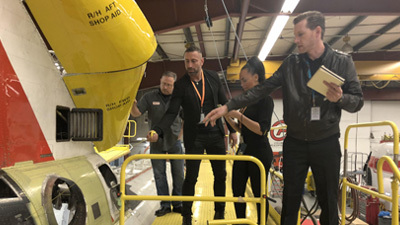 President & CEO, Johnny Buscema, and Account Executive and lead designer, Jenna Hoeg, go through the design process for the first and only AW169 in the USA. S.A.F.E Structure's President & CEO, Johnny Buscema, meets with Mayport Naval Station in Jacksonville, FL to demonstrate their latest equipment designs.